Kjempebillige små pynteesker! Jeg kjøper sikkert en slik ost hver uke, og har begyndt å ta vare på alle tomeskene etter at jeg fant ut at de ville være utrolig lette å pynte.. men hadde d vært muggelost ville jeg ikke brukt de! Papir er lett og feste på dem siden de er lagd av papp, og det er en flott måte å bli kvitt mindre papirark som bruker å ligge igjen etter jeg har scrappet. Har laget en oppskrift på hvordan jeg lagde dem på engelsk, selv om akkurat denne osten er fra Tine har dem sikkert lignende oster i utlandet. Bildene forklarer seg vel selv uansett Kansje en inspirasjon for å begynne å scrappe litt av tom-emballasjen istedenfor å kaste den i søpla? 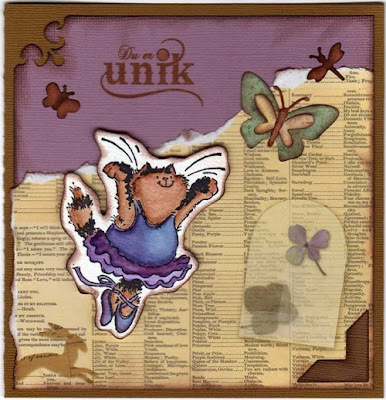 Images: Mary Engelbreit paper pad - friendship. And some paperscraps. Papers: K&Company - Brenda Walton Brianna Paper pad. Basic Grey - Stella Ruby - Fitting at Penny's. And Crate's Static Collection - reaction. Embellishments: Tsukineko Walnut antiquing inks - Willow, Walnut and Cherry Blossom. H2O Shimmering mist - copper. And misc. ribbons and eyelets..
A low-carb treat - and a pink card! = NAM! Veldig likt riskrem! This is just SWEET! A very fast to do dessert - and it is SO yummy! 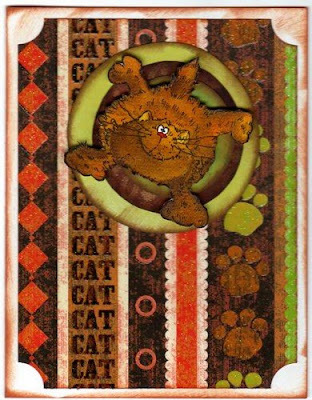 This card I've done using the challenge at 2S4Y Kazan's Sketch #22 Catagorie 1: Individual Card. It's perhaps inspired by my dessert? *lol* The card got a little wrong in the scan I think, 'cause the pink on the edges are more pink in RL - maybe it's the 3D effects that's doing it :( Anyways - pink is not my favorite color - but I need to use up some of my paper-scraps - been piling up on me! *lol* Prize for Card of the Week in this category is from Sakura - and I just love sakura pens - especially their white gel pen, super for highlighting an eye! Stamps/Image: Penny Black stamp - Party Animals, Swirly stamp is 'Bakgrundswirl bröllup' from Magnolia. And the textstamp reads 'Happy Birthday', I think it's from Kort & Godt? Paper: Bazzill, DCWV - sweet neapolitan gltr. And misc scrap papers. Embellishments: 3D stickers is from Panduros Tilda collection 'knappor'/buttons. Penny Black card & a Cuttlebug win! Så moro å være en av de ti som vant den siste utfordringen på Cuttlebug Challenge Blogspot! 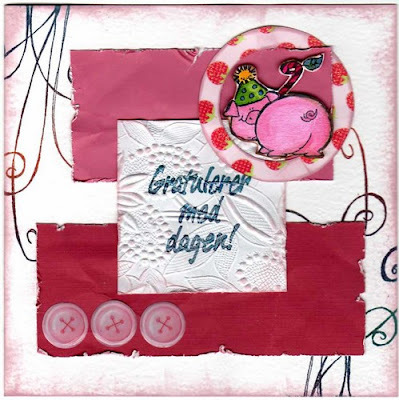 Med kortet jeg lagde til moren min - innlegg 16 mars :) Gleder meg til jeg mottar de digitale stemplene fra Sweet n Sassy stamps! Kjempesøte bilder de har! En kombinert utfordring denne gang, ABC challenge sin theme er F for Flowers, og Our creative corner er å kun bruke max 3 lag papir, og 1 pynt på kortet! 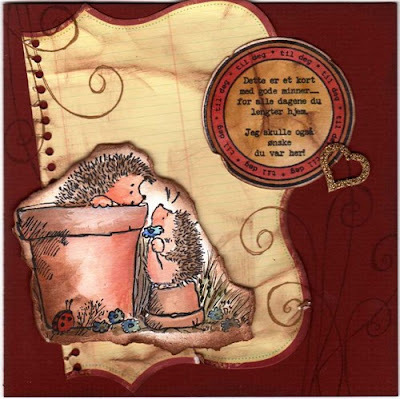 Stamps/Image: Penny Black - Hedgehog visit. 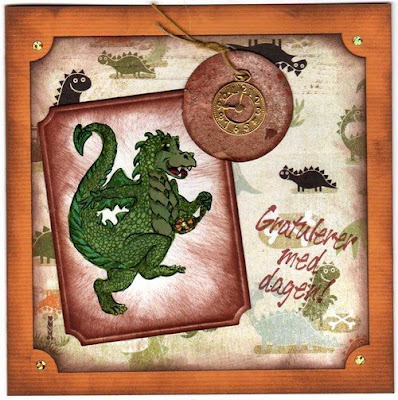 And the text-stamp is from Scrapmagasinet - plate 42B. Swirly stamp is 'Bakgrundswirl bröllup' from Magnolia. Paper: Bazzill cardstock as backing, a Noteworthy diecut journaling paper from M.M., and aquarelle/watercolor paper. Tusen takk for alle de koselige kommentarene dere har lagt igjen på bloggen min! Jeg synes det er så moro å vise frem det jeg lager :) Nå nærmer det seg bursdagen min, og en av dere kan få denne blogcandyen hos meg om dere legger en kommentar igjen på denne posten - og forteller meg navnet på de som lager et av dine favoritt stempler! Gjerne en link til hvor jeg kan finne dem om du vil, men ikke nødvendig :) Og som dere ser er det flere typer stempler jeg ikke trenger link til, allerede flittig bruker av visa-kortet mitt på nett - men på stadig utkikk etter flere!!! *hehe*. Jeg har bursdag den 5. april :) Og kommer til å trekke en vinner da - med en sånn tilfeldighetmaskin på nett, som jeg har sett 'alle' bruker (random.org). Many thanks for all the great comments I've gotten on my blog since I started it - you're all so sweet! My birthday is coming up soon - on April 5th I will be 33! 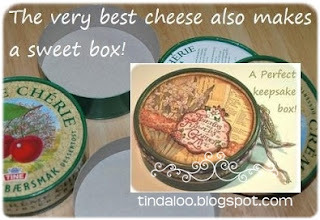 So I have gathered together some blog-candies to send to one lucky girl (or boy!) You don't have to do more than leave a comment here on this post - and tell me the name of a stamp company you love! (I'm always on the lookout for new stamps to add to my huge collection *lol*). If you have a link to the stamps/a store that carries them, that's great, but not necessary. I'll pick the winner via random.org, on my birthday - and I'll ship internationally! Y A very cute EK success Cutterbee - cuttingtool. Y An Imaginisce flower clearstamp from Snag'Em stamps. Y Journaling papers from Making Memories and Prima. Daily Art Stop - Challenge Wednesday. This week is to be inpired by lucky charms! Another great sketch, and the theme of celebration - as the blog is one year old! Happy Birthday CCT! Sukkersött Utfordring #32. Friday. (A norwegian challenge blog). En fargeutfordring!!! Etter det jeg ser på bildet, så syns jeg det ligner på mocca-brun, gammel-rosa, lime-grønn og turkis :) Litt av en kombinasjon - det var litt av en utfordring a finne rette fargene! Supply list for the cards other than bazzill cardstock:.. Truly Scrumptious: I made the buttons with the inside hole of a flower qk die, used my silentsetter to make holes, and after inking them I used glossy accents. And the ribbon is from Basic Grey - Sophie fibers. The stitch stamp is from adornit, text is a stamp from Rhonna farrer. Papers are from Your crafts beautiful - got them free in a crafts magazine. Also Cuttlebug emb. Tiny bubbles, and the stamp is from Penny black - Critter Party clearstamp set. 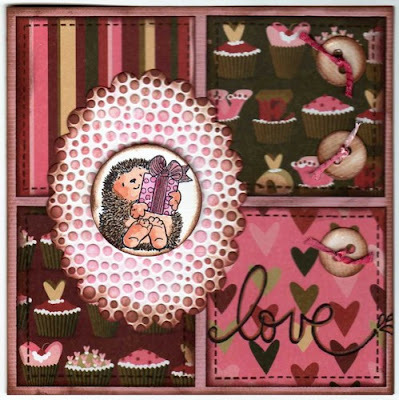 Charisma: Penny Black stamp - Party Animals, Swirly stamp is 'Bakgrundswirl bröllup' from Magnolia. Noteworthy diecut journaling paper from M.M. American Crafts ribbon. The round chipboard I have gotten from a swap, so I don't know where it's from. Cute Card: The heart is from Prima The Goods - heart stamp one. 'Love' is a stamp from Autumn Leaves - Rhonna Farrer. The cute bugs are from Alota Rubberstamps - I do bugs. I've used some mesh, glossy accents (it's not glitter - only shiny!) Swirly stamp is 'Bakgrundswirl bröllup' from Magnolia. Ivy sticky ribbon from Panduro, and the papers are from MME - wild asparagus 'paisley dad'. Adornit - scary vines. Papirdesign.no - Små og store gleder. 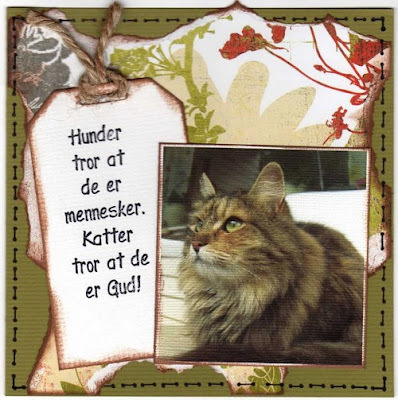 There's a great norwegian magazine called Ett Trykk, mainly for stampers, and on their blog they have this (norwegian) monthly challenge called 'Trykkpressa'. March month's theme is 'Butterflies'. Stamps/Image: Penny Black - pink toes. Text-stamp from Papirloftet - Design Cecilie Lundstad: Du er Unik (reads: 'You are unique'). 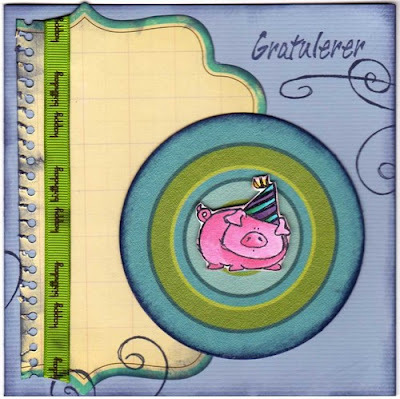 Paper: Bazzill cardstock, K&Company - Brenda Walton Brianna Paper pad. And misc paperscraps. 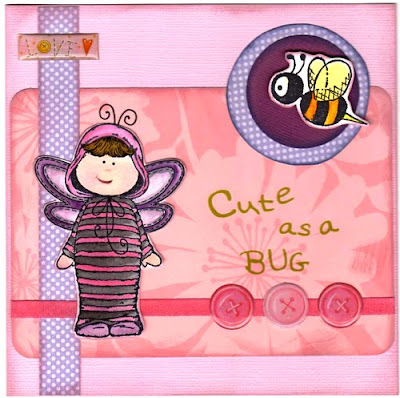 Embellishments: QK Butterfly KS-0172, bugs mini RS-0063, photo corner RS-0471. Morsdagen har kommet og gått, men det er likevel kos å få et kort! 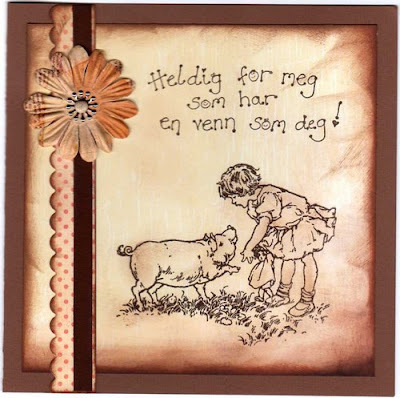 :) Cuttlebuggen har vært i flittig bruk i det siste - fått noen nye spellbinders dieser, bare SÅ anvendelige på kort!!! 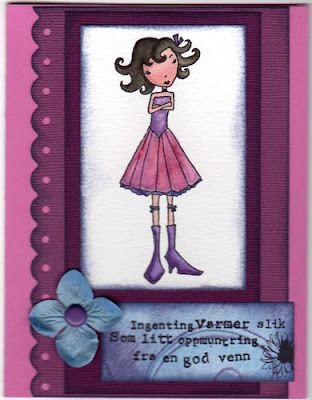 Utfordringen på Cuttlebug-bloggen #22. er å bruke glitter, et stempeltrykk og selvsagt cuttlebuggen da! Glitter er ikke det jeg vanligvis bruker - langt ned på lista faktisk - men jeg kan jo prøve med littegranne..
EDIT: I'm one of the 10 winners of the Cuttlebug Challenge Blogspot! 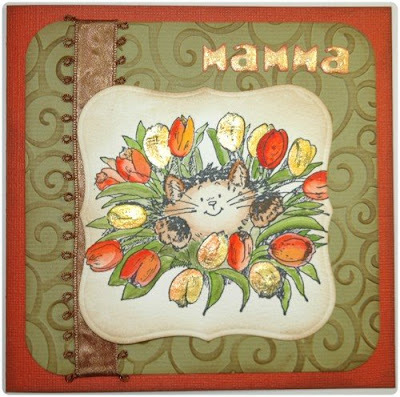 Stamps/Image: Penny Black - Tulip Jungle. Embellishments: I've used the Cuttlebug A2 Embossing die Divine Swirl, and Spellbinder Nestabilities - Labels One. Also QK Moxie Unicase, Ribbon from?, and misc inks. And yellow glitterglue! Stamps/Image: BeeHängla is from the hÄnglar & stÄnglar club kit - spring & summer 2008. The little bee is Magnolia's 'Bibi'. Paper: Bazzill, DCWV - Nana's Nursery papers Baby Boy, ProvoCraft's Rob & Bob Studio - Botanica Awning Stripe. Tre kort med flotte jenter på idag :) Ukens utfordring #52 på My time to craft er å lage et kort med temaet 'kvinner'. Og disse passer jo fint! Stamps/Image: Stampotique - Baby Cakes (Jill Penney & Daniel Torrente). Text-stamp is from Stempelhobby/Kin Flicks (no longer in business) 'Venn 1' by Ksenia - and it reads: 'Nothing warms more than some encouragement from a friend'. On the black card is an unknown (to me) ladystamp. Paper: Bazzill cardstock, Sandylion 'the wind'. Misc paperscaps, and from Prima 'Journaling Paper Squares' by Iron Orchid Designs. 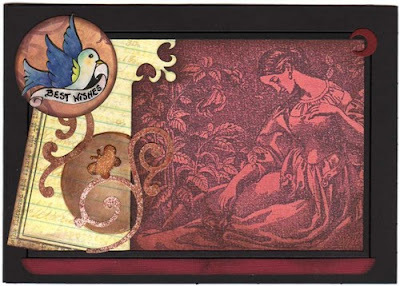 Embellishments: Prima flowers, MM brads, QK diecuts, and bird-sticker from Marah Johnson. (I've used glossy accents on it and written with a zig-pen). Stamps/Image: Papirloftet stempel - Jente og gris, and Ditten og Datten (?) text stamp - wich reads something like: 'lucky for me to have a friend like you'. Paper: Bazzill cardstock, and misc paperscraps. Embellishments: Lost Art Treasures pinwheel, Prima - Artful collage flowers, and Trés Jolie - Mon Cheri - Girl french borders (stickers). Sukkersøtt sin utfordring #30 (innen fredag den 6. mars) er Eventyr - som Frosker, prinsesser, troll, mystiske vesener.. jeg valgte å bruke ett av mine favoritt stempler fra Pyssel Passion denne gang. "Dogs believe they are people - Cats believe they are God!" 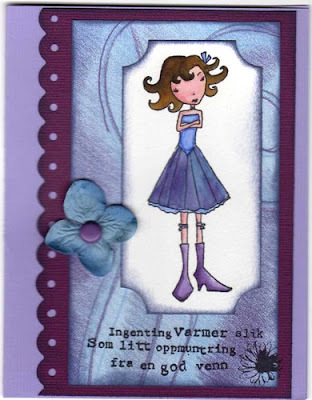 The Princess card is for the challenge at the norwegian blog Sukkersøtt #30. where the card this time should be 'Fairytale-themed'. Stamps/Image: Penny Black - all shook up. 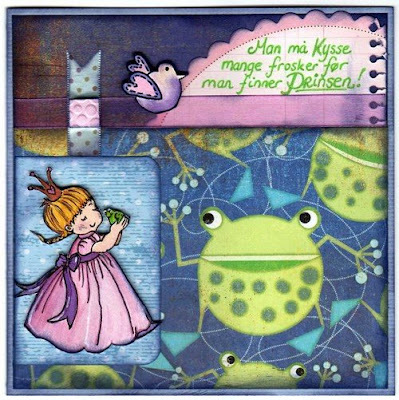 Pyssel Passion (the princess) - Prinsessan og Grodan. 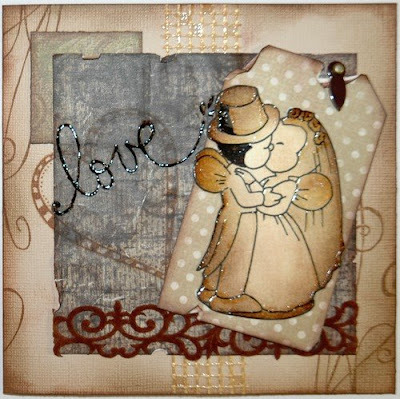 And the tiny birdie is from the Valentin Clearstamps of Scrapmagasinet. The text stamp 'Gratulerer' I think is from Kort & Godt. The other I'm not sure of..
Paper: Bazzill cardstock, and misc. scrap papers. Basic Grey - SkateShoppe 'Ollie' & 'Jasper'. And BG - Scarlet Letter 'Letters to the World'. Making Memories - Noteworthy journaling. And the cat-paper is from DCWV - The Pets Premium Paper Stack. And this one has lots of glossy print! C is for Childs Card! 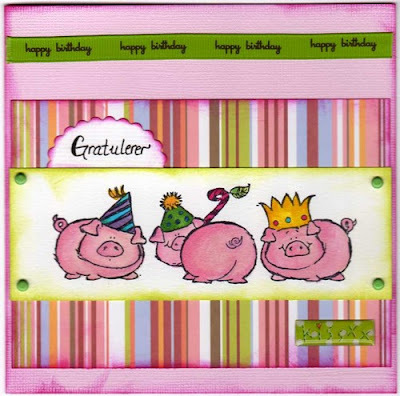 Stamps/Image: Penny Black - Party Animals. Paper: Bazzill cardstock, and ProvoCraft's Rob & Bob Studio - Botanica Awning Stripe.